Serbia Lawn Tennis star, Novak Djokovic on Sunday won a record seventh Australian Open title and a third successive Grand Slam as he swept aside Rafael Nadal in the Melbourne final. Djokovic, who was rarely troubled on his serve, won 6-3 6-2 6-3 to gain his biggest victory in a major final over the second-seeded Nadal, unarguably his biggest rival. The 32-year-old Nadal looked rattled by the world number one’s intensity and made 28 unforced errors. Djokovic, 31, won in two hours and four minutes to move clear of six-time men’s winners, Roy Emerson and Roger Federer. A forehand winner down the line brought up two championship points, with Djokovic taking the second when Nadal clubbed a backhand long. 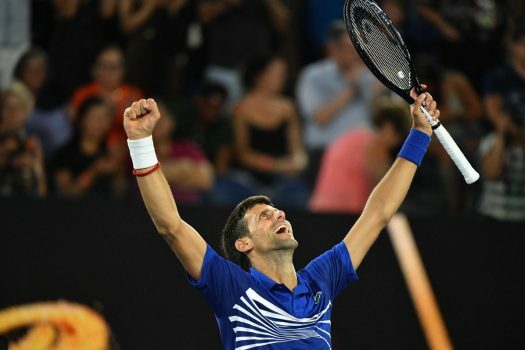 Djokovic, who was the top seed for the tournament fell to his knees after sealing another triumph on Rod Laver Arena, smacking the court with both hands and screaming towards the sky. The reigning Wimbledon and US Open champion claimed his 15th Grand Slam title, moving him outright third ahead of America’s Pete Sampras in the all-time list and closing in on Switzerland’s Federer (20) and Spain’s Nadal (17). Djokovic has now won 13 of his past 16 meetings with Nadal, who has not beaten the Serb on a hard court since the US Open final in 2013. He leads 28-25 in their record 53 meetings between them. The result meant that Nadal was unable to become the first man in the Open era to win all the Grand Slams at least twice and was the first time he had lost a major final in straight sets. Most people expected a much closer encounter between the pair, whose previous meeting at Melbourne Park had been the epic 2012 final, which lasted five sets and almost six hours. “I’m trying to contemplate on the journey in the past 12 months. I had surgery exactly 12 months ago. To be standing now here, in front of you today, managing to win this title and three of the four Slams is truly amazing,” Djokovic said after the match. Nadal responded by saying: “I have been going through tough times over the past year. I only played in nine events and had to retire from two, and I was not able to play professional match since the US Open. However, if Djokovic is to hold all four Grand Slam titles at once by winning the French Open later in the year, he may well have to get past Rafael Nadal, who has won the title a record 11 times.